I was fortunate enough to receive an email from one of my readers offering to review their new Milano Collection Freedom Cap, which is designed to work without clips or combs for a more comfortable fit. I really enjoyed her thorough review and I am sure you will too. Like a lot of sheitel junkies, I was very interested in Milano's new "Freedom Cap." Revolutionary! Patent pending! No more headaches! No clips! No combs! No bald spots! But also like a lot of sheitel junkies, I was much less interested in Milano sheitels themselves, having seen the poor-quality hair, the incorrectly-sewn patches, the overall "cheap" vibe that I got from them. While I wouldn't travel from Monsey to Brooklyn (an hour and a half) just to see what the fuss was about, 10 minutes to the local sale was reasonable. I looked, I felt, I inspected for sewing errors and then ... I tried it on. And believe it or not, the Milano Freedom Cap is everything it's cracked up to be. I want to tell you about the cap, the quality of current Milanos, and my later experience at their Brooklyn salon. The best advice on buying sheitels I ever got was, "Try it on with your eyes closed." Or at the very least, away from the mirror, because we concentrate on the image and tend to either ignore or excuse an uncomfortable, ill-fitting, heavy or scratchy cap. But let's face it, it's the cap that really matters for the 99% of our day that we are not in front of the mirror. If it fits poorly, gives you a headache, or annoys you around the edges, it can be the most expensive, gorgeous hair in the world, and you'll still be miserable. When Milano does an out-of-town sale, they bring in boxes and boxes of sheitels that are "arranged" (barely) on tables by color. They bring mirrors, but there's a good chance you're not in front of one the entire time you're shopping. So the first time I tried on my shaitel-to-be, I went purely on feeling. I chose a closed stretch cap, but I'm told most of them are made with the open wefted cap. (They can be special-ordered with the stretch as well, which is a $50 upcharge.) In the picture, you can see that the multi-directional skin top area is lined with a velveteen fabric, similar to the material a lot of Shabbos robes are made with, but thinner. The nape of the neck also had a thick band of the same material, and the cap is tightened with a pull tab, as opposed to some sheitels which tighten with little bikini top-style hooks. The stretch material is comparable in quality & stretchy-ness to other companies. I found no defects in it. The ear tabs are especially reinforced with boning that gives them a more rigid feeling. And as you can see, no clips, no combs. My concerns (and maybe yours too) were: Will the extra layer of velveteen be hot? Will the cap be too tight? Will the boned eartabs press so hard I get a headache, even without clips? Will that thick band at the nape drive me crazy (and sweaty)? My honest answers are no, no, no and no! I tried on three or four similar sheitels, and the one I chose felt as though they had literally used my measurements -- I'm entirely unaware of the eartabs, the nape comes down just far enough, the forehead fits flat and the skin part is both a natural color for me and wide enough that I can make a deeper part (I always part to the left) and have room to work with. The velveteen is very soft, comfortable and most importantly, breathable. But does it STAY? 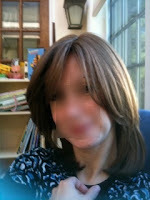 As a mother of KA"H active kids, I need to know that my sheitel will not fly all over the place, and can't be easily whisked off my head by a baby reaching up and randomly grabbing it. Well, girlfriend, I can attest that I can turn my head upside down and the thing DOESN'T BUDGE. I don't mean flip over and flip back so the sides will feather. I mean turn upside down and stay there. Not a millimeter! Amazing, really! The first thing I thought of was, Wow this would be great to dance in at a chassuneh! In speaking to one of the saleswomen, I mentioned that the caps and hair seem to be of a much higher quality than they were even a few years ago. She said that, in fact, a year ago, Milano switched to a different factory. It shows. Could be that they're buying their hair elsewhere as well. As to the hair, while it is not the super-fine quality of virgin European (of which I've owned several over the years), it is European, although almost certainly treated. (As always, expect more evidence of this in lighter colors than darker.) 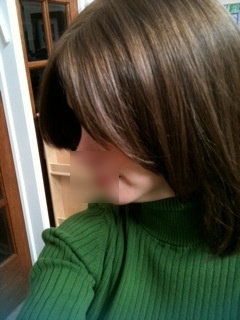 The hair is soft, silky, shiny, and washes beautifully. I always wash my sheitels myself and air dry them, and the sheitel (and the second one I subsequently bought) dries straight & true, with absolutely no frizz or wave, but not the telltale stick-straight of Asian hair. It adapts well to round-brush blowing or hot rollers. There is no knotting whatsoever at the nape, as some companies (like Shevy) are known for. It was a 12 color, but I added lowlights myself so I guess I'd call it a 12/8 now, and the color did nothing to damage either the hair or the cap. The velveteen inside got a bit of dye on it, but this washed right out, as did any dye that got on the skin part material. The photo of the inside of the cap is post-color. My cost was $900 including the $50 email coupon. There is a $50 upcharge each for the stretch cap (open wefting is standard) and the Freedom Cap. I took advantage of the payment plan, in which you pay 25% upfront, then the rest over 6 months on the credit card. You can choose to be billed at the beginning or end of the month. There is an additional $5/month added as a service charge for going through a credit card. Not everything comes in with the Freedom Cap, and I don't know if Milano plans to eventually make everything with it or not. At the sale, I would say about a third of the pieces were Freedom Caps, and maybe a quarter of those had the stretch cap as well. The pony sheitels are not available with the Freedom Cap on the website, but a call to the salon may get you a different answer (perhaps a custom order). Finally, my experience at Milano's MacDonald Avenue salon in Brooklyn. Having fallen hard for my first Freedom Cap, I decided I needed another, shorter model for everyday. (Cue my husband sighing in the background.) I had another coupon and the kids are all in school full-day, so it was now worth it to travel in. The fact that they do payment plans was the only thing that made this possible -- I haven't bought two sheitels in close succession since my kallah days (when an orthodox Jewish woman prepares for her change in married status by buying hair coverings)! I wish more companies did this; it would make good sheitels more within reach to families that are trying to get their daughter introduced to kisui rosh with the best possible experience, while also paying so many chassuneh expenses. I don't know how parents do it sometimes! The salon is a tiny shoebox of a place, located next door to ShopRite and Amazing Savings, so I was able to park in the large lot behind the store and go thru ShopRite. They have a very large number of precuts on display, in blondes and brunettes, very little in redheads however, like most sheitel companies. I was used to salons with neat stacks of sheitels in labeled boxes arranged on walls or in a back room. Not here. At Milano, the standard (non-precut) pieces are piled together in drawers labeled by shade range. I knew exactly what I was looking for, but because of this lack of organization, the saleswoman and I had to go through a few drawers' worth of sheitels, turning each inside out for evidence of a stretch cap and Freedom Cap. Not the most efficient way to do things. What I did like about this, however, was that I had the chance to literally get my hands on every piece they had in my shade range. I was able to put aside whatever looked and felt good, and try on several. Personally, I enjoy the thrill of the hunt, and because I have some experience, I'm not overwhelmed by it. If I were a kallah or simply an inexperienced shaitel-buyer shopping alone, however, it would be a bit of sensory overload. I strongly recommend anyone who matches that description go with a friend who knows sheitels well, whether shopping at their salon or one of their out-of-town sales. The saleswoman was helpful and did not pressure me in any way, and was pleasant throughout, even though my requirements meant so much digging. Although they wouldn't wash the sheitel for me on the spot so that I could see how it behaved wet (I know, I know...) they let me spray it with water and play around with the part to get a better sense of it. There were a couple of stylists, but I didn't get the sheitel styled or cut there. The piece I purchased on that visit was a 14 color, a dirty blonde, which I chose knowing that I would lowlight it to the ashy medium brown I wanted (but can rarely find because the brunettes are usually quite red). It is almost shoulder-length, with some very long layers, and has not required any cutting. (I had the first sheitel, which was about a yard long, cut by my usual sheitel macher.) I wash it, air dry it, and put in several hot rollers for body. It takes and maintains a curl quite well, and the hair is shiny, strong, and in good condition. I use Moroccan Oil products on my sheitels are sulfate- and paraben-free. My cost for the second piece was $800, including the coupon and the upgrades for stretch & Freedom Cap. Summary: Two terrifically comfortable and well-made sheitels with lovely hair, purchased on payment plans, total cost together equivalent to or less than what I normally pay for one virgin European of lesser comfort and requiring combs. Even if their lifespan is no more than a few years [and for hashkafic (Jewish custom & outlook which varies from family to family) reasons I wear my sheitels from the time I drop the kids off at school until I get ready for bed, I never leave the house without wearing a sheitel -- yes I cook in them too! ], to enjoy and be comfortable in a sheitel for the time it's in good shape, the price looks that much better. But from initial inspection, my hunch is that, with proper maintenance, they will last. 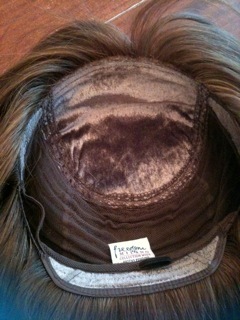 If you're wondering what the big deal is about the Milano Freedom Cap, I think you should try it for yourself and see! @Anonymous (or anyone who knows): what is the head band made of, is it panne velour? Does it have any kind of interfacing, because it seems a thin broad band would crumple up underneath a wig without. I can see velvet working like velcro on hair, however, I'd still want to know if the material is made of cotton, or the synthetic panne velours. Also, what is the material on the eartabs and nape? The velour is the same on all three panels, but on the eartabs it covers a crisscross of two strong "bones" (wires) that hold the eartabs in place. I have to assume that it's not cotton, since when I dyed the sheitel, a little dye got on the velour as well, and if it were cotton, it would have stained. As is, it washed right off. To me, that indicates synthetic. Yes there is some type of interfacing to strengthen both the front and nape bands, but I don't know exactly what. (Maybe someone who sews could take an educated guess?) Even though it's both synthetic and with an interfacing material, I don't feel that it traps heat, which was a big concern for me. Thank you so much! I am a first time buyer and you SAVED me! Keep up the great work, Chavi! Kol tov! My Freeda is clip free, and it is super comfortable. I am very interested in trying on a Freedom cap, thanks for the recommendation! How long is your own hair? My real hair is quite long, and I don't know that I'd be comfortable relying on a clipless wig to both stay on and hold all of my own hair underneath it. hi, I intend to buy a Milano wis soon and I was wondering if their wigs are comfortable enough to be use 24/7? i'm not familiar with this type of cap (I use monofilament tops) so I would appreciate if you could assist me in explaining the differencies betwwen open wefted cap and the ones with the stretch. do them both look like natural skin? is it one better than the other? many thanks in advanced! Where did I get it cut? Freedom wigs are vacuum wigs made in New Zealand - this is not a Freedom Wig. I bought a Freedom Cap Milano 22" length at the Atrium sale in Monsey two years ago. It is my 2nd sheitel, because although the cap is very comfortable the hair is on the heavy side, looks wiggier and I think must be asian. If Milano are buying silky, fine hair now that's a change. I'll have to check it out again because the caps are lovely. I'm afraid to shop online if I end up with more heavy asian hair..but that would be more convenient than those Sales/Shows. I missed the Pesach one anyway. Can anyone please share their MILANO ONLINE shopping experience with us?